If your 3D-Printer suffers from under extrusion then you will most likely notice this when 3D-Prints have missing layers or thin slits in between layers. Under extrusion is a problem that can have multiple causes. It is therefore not an easy problem to solve. You might think that increasing the flow would compensate for the problem, but sadly it is not always that easy. Pushing harder in a queue at the super market does not help either. Below you will find common causes for under extrusion and their solutions. Starting at the filament spool and working towards the nozzle. When your filament spool is poorly wound up or the filament is rolled off incorrectly by the 3D-Printer, the filament can get stuck underneath itself and create extra friction. This added friction will put more strain on the feeder motor and could cause the motor to lose grip on the filament, therefore reducing flow. The solution to this problem is to always make sure to properly load up the spools so that the filament is always unwound properly without causing it to get loose from the spool and start to overlap on the spool. And also if you do experience a tangling of filament, unwind the spool and rewind it so that the filament is again tightly wound up in a coil without overlapping. A lot of 3D-Printers use Teflon tubes to guide the filament from the spool to the print head. When these tubes are damaged due to maintenance, high usage or too high temperatures, the tubes start to add friction to the filament. This extra friction can add a strain on the feeder motor and thus causing under extrusion. Solution: Replace the Teflon tubes or try printing without them to see if they are the cause of your under extrusion. Many 3D-Printers come with an adjustable pressure setting for the filament feeder. This regulates the amount of pressure that the feeder motor is exerting on the filament to maintain grip on the filament. When the pressure gets to low, the motor will start losing grip on the filament and cause under extrusion. If there are contaminants in the extruder head, for example, filament remains that got stuck to the walls of the extruder, the filament can experience more friction when passing through the extruder head to the nozzle. Also it is possible that the feeder motor cog that forces the filament through the nozzle is contaminated with molten or shredded pieces of filament, therefore losing grip on the filament. Solution: Set the extruder to a high temperature and manually feed cleaning filament through it to properly melt away any contaminants. Also cleaning out the feeder motor cog will increase the grip on the filament again. You can do so with our cleaning filament. A clogged nozzle is a very obvious cause of under extrusion. If you cannot find any restrains or problems with the filament getting to the nozzle, then the nozzle requires a good cleaning. The best solution would be to use a small steel wire that is about the same size as the aperture of the nozzle. Then heat up the nozzle and try to clean it out with the steel wire. Heating up the nozzle is important because you need to be able to push away the contaminants inside. If you cannot get the nozzle cleaned out this way, then removing the nozzle itself would be the next step. Most 3D-Printers come with a detachable nozzle for cleaning purposes. You can then inspect the nozzle properly and assess the clog. You can use a hot air blower to soften up or even liquefy the contaminants inside to properly clean the nozzle out. Keep in mind that after the removal of the nozzle, the nozzle offset to the print bed might have changed and the 3D-Printer would need to be calibrated again. High printing speeds can also cause under extrusion. By increasing the printing speed, the filament is rushed through the nozzle at a higher speed to keep up with the print head. If the nozzle is not hot enough, the filament will not have enough time to properly liquefy and will cause a clog or strain on the filament flow. Increasing the print temperature would then be the answer. But keep in mind that some plastics do not respond well to being pushed passed their liquid point. PLA, for instance, is properly printable at around 220 oC but at 245 oC it starts to degrade and it will lose its properties. When this happens, the PLA will start to degrade inside the nozzle and from a tough clog that is difficult to remove. On the flipside, PLA will not be liquid enough to be printed properly below a temperature of 190 oC. The recommended print settings can be found in the specifications of each filament available at Hestay. When you pass the recommended 3D-Printing speed of a filament, your 3D-Printer is probably going to be suffering from under extrusion. The printing speed is often expressed in volume per second (mm3/s) and is easily calculated with the diameter of your nozzle, layer height and extruder speed. For example. 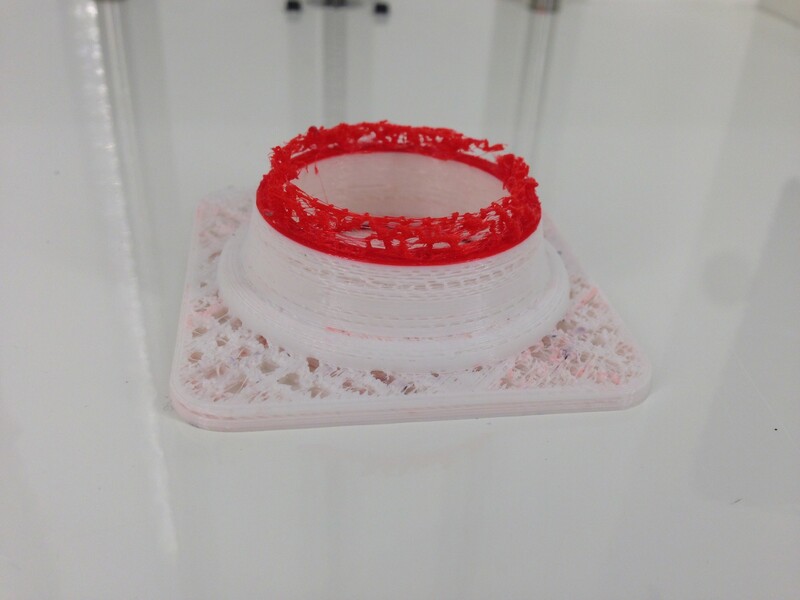 You are printing a 3D-Print with an 0.4 mm nozzle, a layer height of 0.2 mm and a print speed of 50 mm/s. Then your volume printing speed is going to be the product of these three value’s (0.4 x 0.2 x 50) which is equal to 4 mm3/s. 8 mm3/s is considered a reasonable limit when trying to prevent under extrusion. Any value higher than that increases the risk of under extrusion considerably. If you have any questions about under extrusion or the prevention of it but could not find your answer on this page, feel free to contact our customer support service for more information and answers.